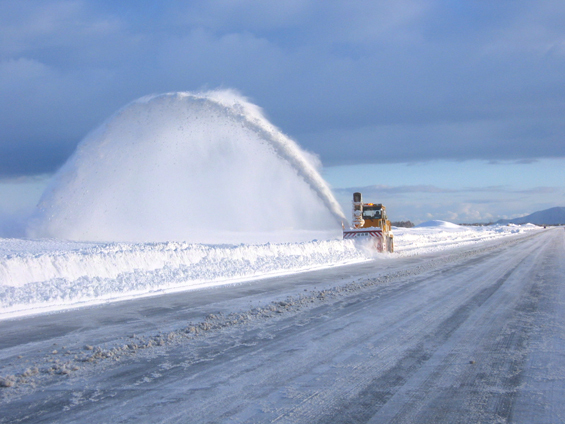 ﻿A snowblower clearing snow from the runway at Aomori Airport. When we arrive at Aomori Airport’s terminal building to meet with the airport director, the board hanging behind the information counters near the first floor entrance shows numerous flights have been canceled. With the entire surrounding area covered in white and snow falling steadily everywhere, one’s first thought might be that the weather is the culprit. But in fact, this is far from the case. For as long as this airport has been in operation, not one flight has ever been canceled due to the accumulation of snow, despite the fact that it sees the most snowfall of any airport in Japan and more than most airports in the world. The cancellations today, it turns out, were a result of record amounts of snowfall in Tokyo and other regions that send regular flights here. One of White Impulse's snowplows with the Aomori Airport terminal building in the background. “Over the 50 years this airport has been open, a failure to clear snow has never resulted in a flight cancellation,” says Masato Kanazawa, the airport director. The key to this achievement is a snow removal team the airport calls “White Impulse.” Since more snow falls in Aomori than in any other prefecture in Japan, with an average accumulation of 669 cm (21 feet 11 inch) in 2011, a major effort is needed to keep transportation systems, such as trains and roads functioning smoothly. The airport, in the city of Aomori, is certainly no exception, with over a meter falling on its grounds in the same year. When snow gathers inside the small furrows that run widthwise across runways, landings and takeoffs can become more dangerous, so for passenger safety, it is of the utmost importance to keep the surfaces clear. 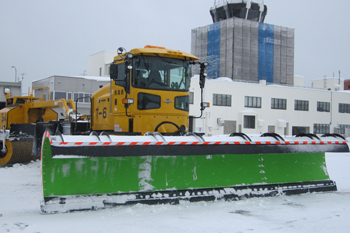 Airports in northerly regions generally have dedicated snow removal teams and given Aomori Airport’s extreme conditions, a specialized approach ? embodied in the White Impulse team ? has been developed. An area of 550,000 sq. meters, which includes a 3,000-meter runway, taxiway and apron, must be cleared within 40 minutes and White Impulse is able to achieve this through the simultaneous deployment of 38 vehicles. In this operation, timing is crucial. If removal is completed too quickly, snow can accumulate again by the time the plane lands, and if it’s done too slowly, the plane will be unable to land until the removal has been completed. While the technology is not Japanese, with the vehicles manufactured by such companies as Oshkosh, the formation in which they move across the runway is unique to this airport, according to Takahiko Sasa, who helps manage the team. 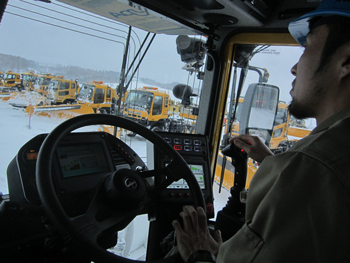 Seiya Tsutsuma, one of the members of the White Impulse snow removal team, drives us around Aomori Airport in a brand new Oshkosh snowplow. When White Impulse is mobilized, the team forms a line that spreads across the runway and moves along it at about 20 km per hour. At the front is a snowplow and behind that a snowsweeper, then another snowplow and another snowsweeper. Behind this are three consecutive snow sweepers with attached plows and six more snowplows. In the back of the line is a snowblower, which launches the snow the other vehicles have swept to the side off the runway. First, the team sweeps down one side of the runaway before doubling back to clear the other. Smaller vehicles move in after the main deployment to clear leftover patches. After this, trucks move out to spray down antifreeze. Finally, one last car is sent out to measure the amount of snow remaining using a friction meter. 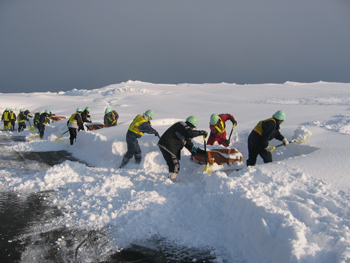 White Impulse team members shovel snow in areas their plows cannot reach. After our interview with the director and the administrative staff, we are taken outside to see the vehicles parked on the runway. Soon one of the White Impulse members came out and took us for a spin in a brand new Oshkosh snowplow. The interior was full of strange dials and wiring, unlike any vehicle I’ve ever ridden before, and it moved with surprising speed for such a big machine. Snow removal is only required from the months of November to March, so the members hold down other jobs in the warmer seasons, with the majority of them working as farmers. But although this is not their only duty, they treat it with dedication. “We think the way we’ve been doing it works well, but if there’s a better way to do it, we’re always interested in exploring it,” says Fukushi. The team was dubbed White Impulse in homage to the Japanese Air Self-Defense Force’s Blue Impulse aerobatic demonstration squad. Over the last several years, White Impulse has been gathering attention in the Japanese media, with televised reports on NHK and other networks as well as stories in major newspapers. According to Takahiko, many tourists from southern countries with little or no snowfall head to the windows of the terminal and the rooftop viewing area specifically to watch White Impulse work its magic. Representatives from airports in Hokkaido have also reportedly visited in order to watch White Impulse and improve the effectiveness of their own snow removal teams. However, for other airports to achieve such improvements it is not simply a matter of straightforward imitation. “Each airport is different, with different runway dimensions and different kinds of snow, so particular methods have to be developed for maximum efficiency,” says Takahiko. Aomori Airport is located not far from the city center and has regular flights to Tokyo, Osaka, Sapporo, Nagoya, Seoul and other destinations. White Impulse is deployed from November through March and may be seen during this time depending on weather conditions, but there is a greater chance of seeing them in action in the months of January and February when snow falls almost constantly.